Oleksandr Briagin/ShutterstockYes, you can make a good steak in a pan. A few months ago, in an attempt to cook a restaurant-quality meal for my boyfriend’s birthday, I made steak for the first time in my life. Save for setting off the fire alarm in my apartment, it was a success. Since I don’t have access to a grill, I cooked the filet mignon I had purchased from Trader Joe’s in a pan. While some people may wince at the idea of cooking steak in a pan, there are a few things you can do that will ensure it tastes great. 1. If you can, use a cast iron skillet. The hotter your pan gets, the better. Cast iron skillets not only get hotter than regular pans, but they also stay hotter longer, which is equally important since you want your steak to cook evenly. 2. Make sure your pan or skillet is hot before placing your steak into it. You’ll know your pan or skillet is ready for your steak when smoke starts to rise from it. Another test you can use is to throw a few drops of water on the pan. If droplets stay on the surface like little bubbles, you can throw on your steak. 3. Your steak should be seasoned and at room temperature before you start cooking it. All chefs will tell you that good steak needs very little seasoning, so you can just use a little bit of salt and pepper, or a little bit of garlic salt. Then either brush some olive oil directly onto the steak, or pour some into the pan. Make sure to let the steak warm up to room temperature after taking it out of the fridge. 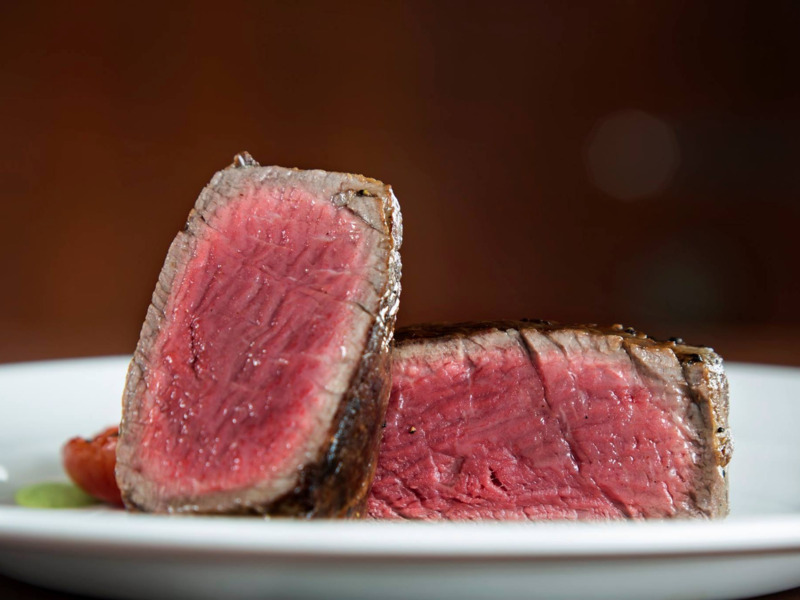 Halls ChophouseFor steak done just right, use a meat thermometer to check its temperature. 4. Check the temperature of your steak before serving it. 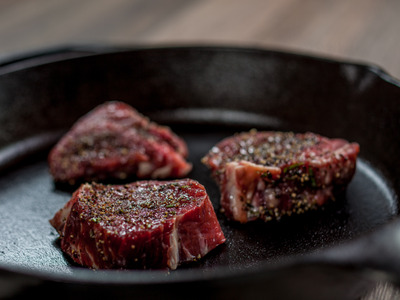 I’m not enough of a cook to have a meat thermometer in my kitchen, which is the tool you should use to check and see if your steak is cooked the way you like it. It will give you the most accurate read on the doneness (or rareness) of your steak. I used the less professional method of cutting into my steak to make sure it was cooked right. 5. Let your steak sit before eating it. However tempted you may be to dig into your steak when it’s fresh out of the pan, don’t do it. Giving your steak five to 10 minutes to breathe will result in the juices redistributing in the meat, which in turn results in a better-tasting steak. Bonus: Baste your steak in butter just before taking it out of the pan or skillet. I didn’t exactly do this when I made steak (I just dropped a hunk of butter onto each steak because I wasn’t really sure how to baste), but this trick is supposed to give your steak a buttery outer crust. To baste, just drop some butter into your pan, tip it so that the butter collects at the bottom, and then bathe your steak in it.